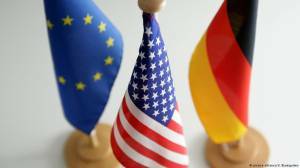 Although Democrats made electoral gains in Tuesday's midterm elections, officials in Germany and other European Union countries said they do not believe the results will prompt a change in US President Donald Trump's approach to foreign policy. "It would be a mistake to expect a course correction from Donald Trump now," German Foreign Minister Heiko Maas wrote on Twitter. He emphasized that the United States remains Germany's closest partner outside of Europe, but in order to maintain that partnership he said, "We will have to recalibrate and adjust our relationship with the USA." The Democrats regained control of the House of Representatives in Tuesday's polls, but Trump's Republicans strengthened their grip on power in the Senate. The transatlantic coordinator for the German government, Peter Beyer, was also skeptical that Tuesday's election results will ease Europe's worries, particularly since NATO matters and international trade are under the jurisdiction of the Republican-controlled Senate. "I don't think we should expect too much from this outcome and the impact on us," Beyer told German public broadcaster ZDF. Frans Timmermans, the vice president of the European Commission, wrote on Twitter that US voters "chose hope over fear, civility over rudeness, inclusion over racism, equality over discrimination." "They stood up for their values. And so will we," the Dutch politician added, looking ahead to the European Parliament elections in 2019. Pierre Moscovici, a former French finance minister who is the European commissioner for economic and financial affairs, made an ironic comment about Trump's claim of "tremendous success" in the election. "The Democrats win the House of Representatives for the first time in eight years despite powerful Republican gerrymandering," Moscovici wrote on Twitter. "Donald Trump is right: 'Tremendous success tonight.'" Manfred Weber, a German politician who heads up the European Parliament's center-right European People's Party (EPP), said the results were a "mixed signal." With Democrats in control of the House of Representatives, pushing through Trump's legislative agenda will now be harder, Weber told local public broadcaster Bayerischer Rundfunk, adding that Republicans and Democrats will have to work together to find solutions and "that is perhaps the good news of the day." Some in Germany saw the election results as an opportunity to forge better ties with Congress, and possibly block actions from Trump that could negatively impact Europe. "Now there are more people in office who might be more open to having a constructive dialogue with Europeans and I think Germans will use that opportunity," Daniela Schwarzer, director at the German Council on Foreign Relations (DGAP) told DW. Jürgen Hardt, the foreign policy spokesman for German Chancellor Angela Merkel's conservative bloc in parliament, said Germany needs to quickly line-up talks with the new members of Congress in Washington. Berlin especially needs to make clear the "the importance of the transatlantic relationship" to the new representatives and senators, he told public broadcaster SWR. Annalena Baerbock, the co-leader of the Greens, hailed the election as a "good day for democracy in America," adding that the results show "that discriminatory rhetoric and policies of marginalization do not win over the majority." Overall, Democratic candidates for Congress won nearly 14 million votes more than Republican nominees. Backing for Trump came from the far-right Alternative for Germany (AfD), who congratulated the US leader on his victory in the Senate, saying the results were due to his "successful economic and migration policy," reported DW's Thomas Sparrow.